Back exercises are important in order to keep the back strong and pain-free. Did you know that 50% of all working Americans experience back pain symptoms each year? Or that back pain is one of the biggest reasons given for missing work? Back pain is serious and shouldn't be dealt with lightly. To keep the back from getting weak, it's important to do exercises regularly. The back is a part of the core which needs to remain strong in order to promote correct posture in the body. Plus, if you're working out or plan to start a new workout program, be sure to include some back exercises. · Grasp a pull up bar with your palms facing you and position your hands a little narrower than shoulder-width apart. · Slowly lower back down to the starting position. · Repeat for as many reps as you wish. · Grasp a barbell with palms facing down, keep a slight bend in the knees and bend over at the waist keeping your arms perpendicular to the floor. · Exhale, lift the barbell towards your body, keeping your elbows close to the body. · Inhale, and slowly lower the barbell back down to the starting position. · Keep the back straight, knees bent and bend over to grasp the bar with an overhand grip with hands about shoulder-width apart. If it isn't comfortable, try an alternate grip (one hand over, one under). · Exhale, then push up with your legs to a standing position, keeping your torso upright, your chest out and your shoulders back. · To go back to the starting position, bend at the knees while leaning your upper body forward, but keeping the back straight. You have completed one rep when the weights touch the floor. Always be sure you have proper form when performing these back exercises in order to prevent injury. Begin with a relatively light weight and gradually move up from there. 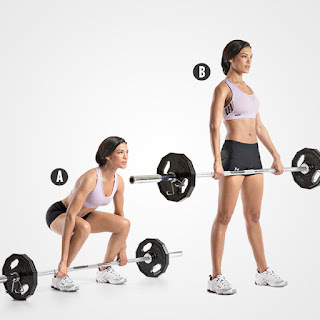 If you are interested in learning more about lower back exercises for women along with full body workouts, lower body workouts and upper body workouts, please visit Melinda's Fitness Blog.